Public clouds are known for elasticity of compute resources. For example, AWS AutoScaling Group (ASG) can dynamically scale up a compute farm (VM or cloud instances) to service higher load or scale down to safe cost during off hours. 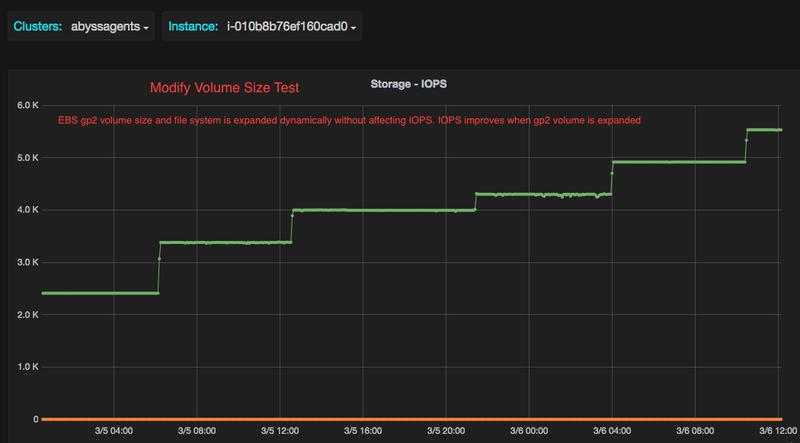 What missing was a dynamic scaling of block storage such as: online volume expansion, storage tiering or temporary boosting volume's iops and throughput. Recent announcement of Elastic EBS feature addressed some of these shortcoming. SAN features like online modification of volume attributes (size, iops and type) without detaching or attaching volume or restarting an instance are now possible in public cloud. No down time is required! EBS (Elastic Block Storage) is AWS network storage offering that allows attaching block storage to a running cloud instance in a given Availability Zone (AZ). EBS volumes support both: solid state disks (SSD), called io1, gp2, for improved random iops or lower latencies, and magnetic disks (HD), called st1 and sc1, for higher sequential throughput. 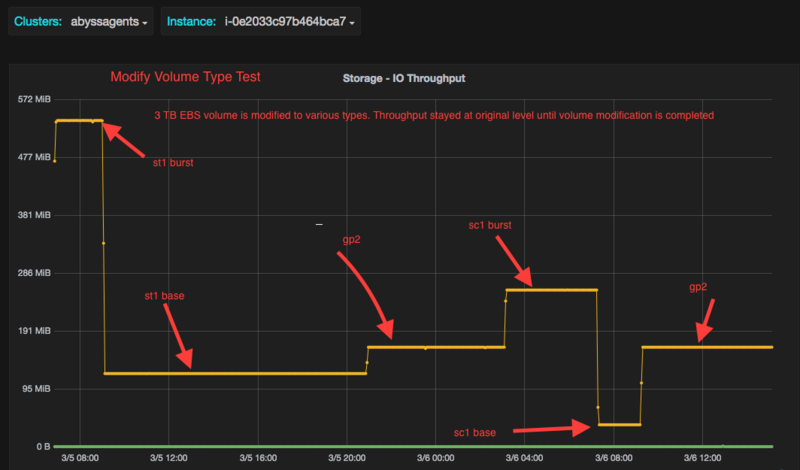 Elastic EBS feature makes it possible to mix and match EBS volume capabilities to achieve best storage performance for a given workload. To improve sequential IO throughput for Analytics and DSS queries, io1 or gp2 volumes can be modified to st1 volumes that offer higher throughput than io1 and gp2 volumes. Instead of over-provisioning storage, start with a fixed size EBS volumes for all instances in your cluster. Monitor EBS volume capacity and raise it when reaches 80-90%. This may save cost as the capacity increase is performed on as needed basis. EBS storage saves great deal of administration work as compared to ephemeral storage (direct attach storage). EBS is persistent storage and thus does not require additional steps in protecting data such as copying or refreshing data, as in the case of ephemeral storage, on instance launch. Elastic EBS feature makes EBS more attractive as it takes away the size consideration out of capacity planning decision. Both volume and file system can be expanded online without requiring instance reboot. Two new EBS API calls: ModifyVolume and DescribeVolumesModifications were introduced to support Elastic Volume feature. awsconsole, awscli or API calls can be used to modify volume. Completion status can then be polled via Cloudwatch metrics or via DescribeVolumesModifications API to trigger some action. There is a limit on one modification request per volume every 6 hours. Volume modification change request takes from few seconds to tens of minutes to complete. Minimum charge is for 6 hours once volume modification is completed. 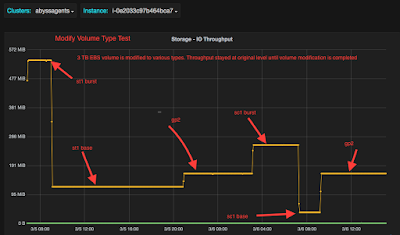 Modify volume option "iops" applies to "io1" (provision iops) EBS volume only. Modify Volume option "size" can only be used to increase the volume capacity. Shrinking volume is not supported! Both ext4 and xfs support growing file system online. File systems cannot be grown online if EBS device is under Linux MD and RAID volume type is RAID-0. Linux MD RAID supports growing for RAID-1 (mirror) and RAID-5(parity) volumes only. File systems can be grown online on drbd device as long as drbd device is backed up by LVM. Modify options: "iops" and "type" (except "size") are transparent to instance and thus can be done to all types of configurations (raw, block, MD, LVM, drbd etc..) . AWS IAM InstanceProfile need additional permission to run ModifyVolume and DescribeVolumesModifications API from the instance to modify volume online. One can use scripts provided in the script section of this document to modify volume's iops, size and type. One can use AWS lambda function provided by AWS to tag all volumes requiring size changes to set "maintenance" tag and then a script that runs on the instance to resize all targeted volumes. EBS continue to evolve to match SAN like features in public cloud. We expect more SAN features to be added into the growing feature list in the future such as: Thin provisioning, deduplication, LUN level snapshots or mirroring and multi-attach volumes for clustering application like Oracle RAC or clustered filesystems. NOTE: EBS does support snapshot feature, but snapshot is saved to S3. When restored, data is copied to EBS volume as the data is accessed (lazy copy). 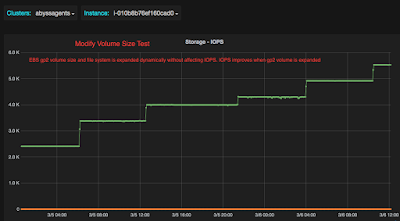 Due to lazy copy from S3 to EBS , IO latencies jump to 100ms from 2-5 ms until all blocks are copied to EBS from S3. LUN level snapshot copies the data directly to destination LUN.